After contact has been made and the options discussed in detail. You send the agreed payment or deposit via PayPal, Credit or Debit card using the “Add to Cart” button on this page. You can also pay a deposit by cheque. Booking more than 1 space? Select “Full Day – Per Person £50.00” After you have been directed to PayPal, update the Cart quantity. If you want to book multiple dates just send one payment which can be used as a rolling deposit. You will receive an email confirming receipt of your deposit..
A booking is provisional until your deposit has been paid. Any balance (if applicable) is due in cash on the day. Our Terms and Conditions apply and by sending payment you are accepting them. You MUST call me on 07754 324270 after 6:30pm on the evening before your trip. This is to ensure that weather conditions are suitable. 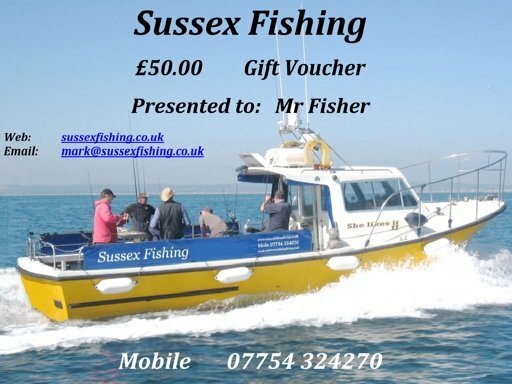 If your fishing trip is cancelled, we can organise another date to go fishing, or arrange a refund of your deposit. The choice is yours. Deposits and payments are refundable, or can be transferred to another date in the following situations. The trip is cancelled due to an adverse weather forecast the day before or on the morning of the trip. The boat is unable to put to sea because of a mechanical breakdown, or other unforeseen circumstances. As per section 4 of the terms and conditions. Sufficient notice to cancel is given. As per section 3 of the terms and condition. Please read the terms and conditions for more detailed information. End tackle on hire rods is loaned. A modest charged is made for tackle losses. Bait can be supplied on request. Enquiries are welcome from individuals, the skipper can usually make up crew numbers if given enough time. The minimum number of anglers I will go to sea with is 3 when ground fishing and 6 when wreck fishing. Evening trips can be arranged as and when. Please call for details. Departure is usually 07:30 or 08:30 but can be earlier to catch a more favourable tide. I usually return on either the 15:30 or 16:30 lock There is some flexibility as lock out is on the hour and lock in on the 1/2 hour and trip times can vary slightly. Spaces Available on the dates below.